You might think that getting slagged as an intemperate martinet who alienated and exploited an overworked staff at a studio that completed just one video game before going bankrupt would be, well, limiting to one's future career options. Not Brendan McNamara of the former Team Bondi. McNamara tells Eurogamer he is at present writing up proposals and pitching what he considers to be "one of the great untold stories of the 20th century," for a big-budget video game. He is confident enough that someone will bite on it, telling Eurogamer he hopes to have something announced in a few weeks. "There are a few people interested, yeah," he said. "I've still got to do the paperwork." He said the lessons learned in building The Getaway for Sony and L.A. Noire have a practical application he still wants to build on. "We think the evolution from The Getaway to L.A. Noire and learning the lessons we did on the way, and some of the stuff about emerging storytelling, is definitely an avenue to pursue." McNamara, to put it bluntly, was not well liked. Rumor that he might come aboard George Miller's KMM studio provoked outrage among the many Team Bondi employees who had gone there after the studio's dissolution. 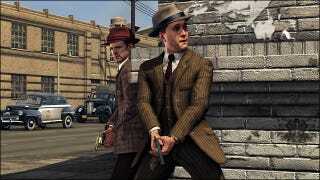 Many alleged he was responsible for abusive work practices and a nasty management style that saw continual turnover at Team Bondi, which took seven years to make L.A. Noire. That said, back in August a source mentioned to Kotaku that Miller himself was very impressed by McNamara's commitment to his artistic vision in the face of deadlines. So he does have admirers, they just don't work for him.